Graphs are a form of common data structure used in algorithms. You see graphs used in places like maps for GPS and all sorts of other places where the top down approach of a tree structure won’t work. A graph is a sort of a tree extension. As with trees, you have nodes that connect to each other to create relationships. However, unlike binary trees, a graph can have more than one or two connections. In fact, graph nodes often have a multitude of connections. To keep things simple, though, consider the graph shown. Graph nodes can connect to each other in myriad ways. In this case, the graph creates a ring where A connects to both B and F. However, it need not be that way. A could be a disconnected node or could also connect to C. A graph shows connectivity between nodes in a way that is useful for defining complex relationships. Graphs also add a few new twists that you might not have thought about before. For example, a graph can include the concept of directionality. 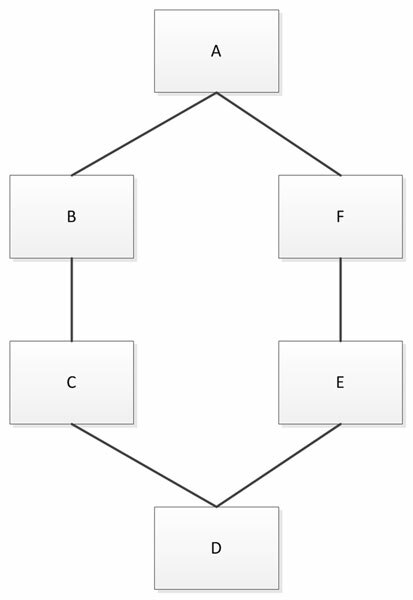 Unlike a tree, which has parent/child relationships, a graph node can connect to any other node with a specific direction in mind. Think about streets in a city. Most streets are bidirectional, but some are one-way streets that allow movement in only one direction. The presentation of a graph connection might not actually reflect the realities of the graph. A graph can designate a weight to a particular connection. The weight could define the distance between two points, define the time required to traverse the route, or provide other sorts of information.